Hi Woodworkers and Woodturners and Woodworker-turners! We just sent out the June issue of the Highland Woodturner and it is packed full of fascinating and useful woodturning tidbits. We included a great article on turning multi-layer chinese balls – those intricate and impossible looking pieces you sometimes see and assume are completely beyond your turning capability. Turns out that with a little practice and a lot of persistence, you can make your own! Also included in this month’s issue is another post and video from our woodturning blogger extraordinaire, Terry Chapman, where he explains how using Easy Wood Tools doesn’t always make woodturning simple. And just like any other type of woodworking, even the safest tools require practice using them. 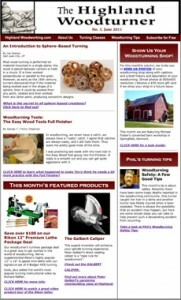 We’ve also got a great Vermont-based woodturning shop, a new woodturning tip from Phil Colson and a couple great product deals for you, so check it out!